Army Gifts that will commemorate military achievements and celebrate special occasions. Purchasing gifts online provides you with many design options. Many online shops like Military Online Shopping offer to customize the gifts for you. The Gold military rings can be personalized with the soldier’s name and also the enlistment dates. Army gifts are bought by loved ones for active duty soldiers and as retirement presents. Whether it is a son, or a loved one, it is now possible to get him a unique gift that will be treasured forever. Men and women who serve in order to protect the nation deserve to be honored and remembered in a special way. Below are some military gifts identified for those in active duty as well as retired military personnel. By designing a custom made ring, you can show a loved one that you honor their loyalty and commitment. Have their name engraved inside along with their years of service. 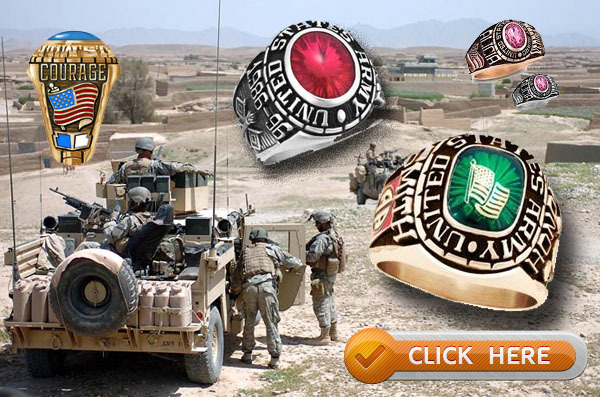 Handcrafted Army rings specifically designed and personalized make ideal gifts. Gold and Sterling Silver Army rings representing a particular division or unit are easily designed. What a wonderful way to be honored at the time of retirement for your sacrifice and service. Personalized jewelry gifts will always be treasured. Other great gifts are personalized swords with a matching shield. Amy watches with the logo is always popular. Rings are a favorite as they can be engraved with many personal details. Tapestries and embroideries are also quite good when they have been custom-made. When a soldier retires it is usual to have a family gathering or a military party. During the course of the evening a presentation is organized to honor the individual. Some of the best items to honor the retiree are rings, plaques and watches. If any of these items are customized, then it adds to the occasion. At Military Online Shopping you can purchase some of the traditional veterans gifts that have been give to soldiers of all ranks over the years. Gifts that have stood the test of time.